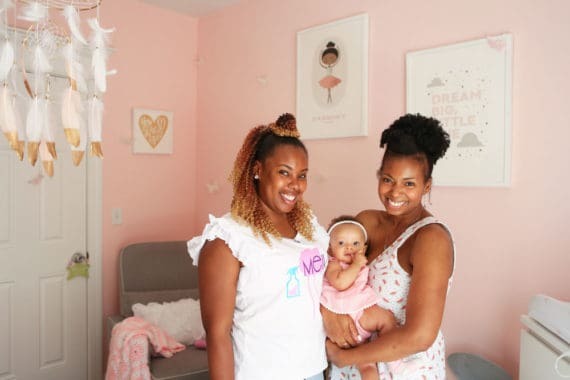 Baby Cakes’ Baby Girl Nursery Design – A behind the scenes look into my daughter’s nursery design along with tips and tricks to design your own. I seriously had no clue what I wanted to do for Harmony’s nursery design. I just knew that I wanted it to feel fun, inspired and sophisticated. I wanted it to be a room that she could grow into and feel was mature enough for her a few years down the line. Because the hubby and I live in a two bedroom condo, we knew we were going to be redoing the second bedroom which was a sitting room and office before. I wish I had a photo of that space how it was before because it is the grandest transformation I have ever seen. I worked with Tameika Hinton, owner of Meikas Cleaning, to totally organize and design the space. Tameika has been helping to organize my home for a couple of years now, and she keeps putting up with me as I continue to not do a great job of keeping it up. She first worked on the kitchen and then moved to the bedroom and finally made Harmony’s room a dream come true. Once we cleared everything out of the room and painted it in a lovely yet dainty pink (pink is my signature color) named Harmony (it was kismet), we were ready to create something special out of this blank space. 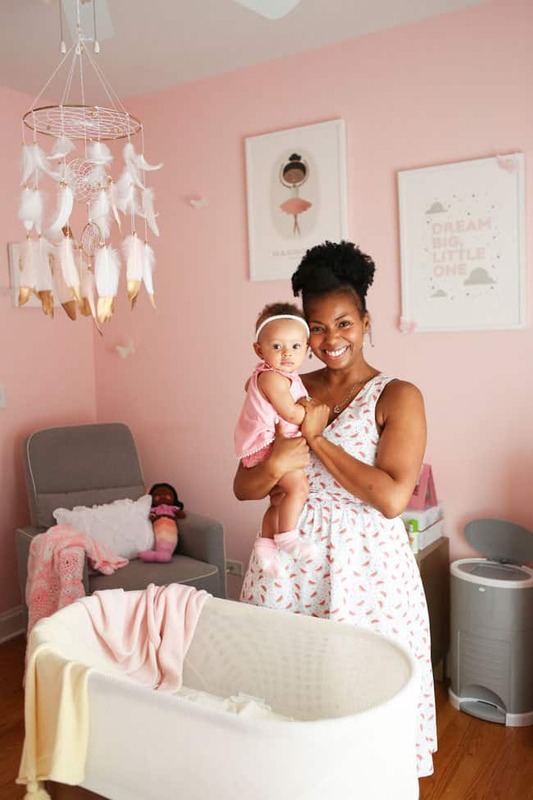 Here are some tips for how you can make your baby girl nursery design something really special as well. It really all started with the beautiful artwork I saw at Minted. When I first saw the “Dream Big Little One” print, it felt so magical and motivational that I knew I wanted it in Harmony’s room. I wanted Harmony to feel she could reach for the stars in any way she wanted. The ballerina print felt equally special, and I loved that it could be totally personalized with her name. The pinks coordinated so well together that I went in the direction of including both. I knew I wanted a mobile that was different than anything else I’d seen. When I went to Etsy and found this gorgeous dreamcatcher with the most charming gold painted feather, I ordered it right away. It felt so mature and stunning for the space. I knew it would really make it space stand out. I found the amazing butterflies at Pottery Barn. I thought they added so much whimsy to the space hanging from the walls and on various pieces like frames and the curtains. I love the blanket and rug that I received from Lorena Canals. The details were so fun, and the ombre colors of soft pink and vanilla were lovely in the space. Also the rug is washable. Seriously how impressive is that? 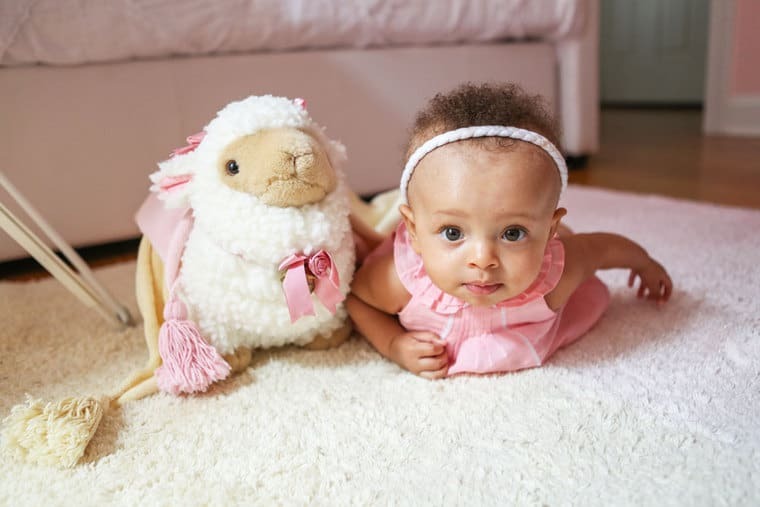 When dealing with spit ups and spills, you definitely want to have a rug with that capability. I am not the most organized person. I can definitely admit that. I had to rely on the incredible assistance of Tameika to really structure the room. She totally organized every single facet of that room beyond believe. If you have the budget, I suggest getting some help from her or someone else in your area though she will travel!! 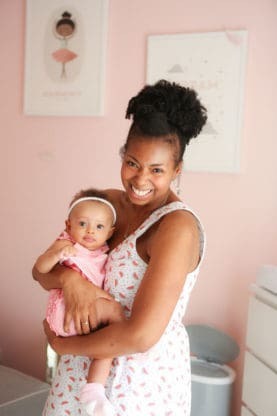 Being pregnant, exhausted or beyond anxious about a new life is way too much to think about in addition to designing and organizing a baby’s room too. She organized the drawers with dividers with everything from Harmony’s headbands and socks to her washcloths and swaddles. Each and every drawer is organized to a tee, and everything is in its place. She also did something pretty genius with a shoe organizer. She added it to the back of Harmony’s closet and added her toiletries to it. I can see everything from her lotion and baby wipes to shampoo and baby wash. I can also see when we are running low on something so it can be replenished. Lastly, the closet is organizational bliss. I know adults that have envy over her closet. I knew Harmony would have a ton of clothes based on the baby shower gifts and my obsession with dressing her up all the time. Tameika organized all of her clothes by size and added the cutest hot pink hangers to the space as well. She also added shelves to my space for shoes, other baby items and diapers. I hope this post provides some good advice and helps inspire you when working on your nursery design. It was such a fun and exciting process, and I can’t wait to see how it transforms again as Harmony gets older. Also if you are looking for information on newborn sleep and sleep training, check out this post. A special thank you to Meikas Cleaning, Minted, Lorena Canals, and Snoo for providing items and services for this room. So beautiful, I love seeing the changes in her. The nursery is beautiful. Thanks for sharing. Awww thank you so much Bern! Love her room!! Baby cakes is so beautiful!! I love following your journey with her as well as your delicious recipes!! By the way, we have the same birthday (although I’m 10 years older lol) Keep up the great work my Gemini Sister!! OMG we have the same birthday!!! Hooray happy belated! SO GORGEOUS. Lucky little Harmony to have such a pretty room! Just beautiful. I am a 77 year old grandma that loves babies and cooking. I so much enjoy you, your baby and recipes. Love the nursery.